Rebellions are uprisings of subject peoples making demands of their regent, mostly for more autonomy or complete freedom. They are caused by unrest and certain events. Rebellions may be combated by increasing province autonomy to reduce unrest, harsh treatment, or brute military force to slay the rebels once they rise up. Each province has a number called unrest denoting how discontent the people of that province are. Unrest is controlled by many factors. Some are specific to a province (local unrest), while others affect unrest in every province in the country (national unrest). The total unrest in a province is the sum of its own local unrest and the country's national unrest. Stability: +2 per point of negative stability, and −1 per point of positive stability. Legitimacy: scales linearly from +2 to −2 as legitimacy varies from 0 to 100. Republican tradition: scales linearly from 0 to −2 as republican tradition varies from 0 to 100. Horde unity: scales linearly from +2 to −2 as horde unity varies from 0 to 100. War exhaustion: +1 per point. Advisor: a Theologian will reduce unrest by −2. Government type: Despotic Monarchy, Tribal Despotism and Elective Monarchy all give −1 national unrest. Tolerance: +1.25 per point of negative tolerance and −1 per point of positive tolerance towards the local religion. The maximum bonus from tolerance of heretics or heathens is −3. Orthodox countries get an additional unrest reduction in true-faith provinces depending on their Patriarch Authority (linear scale from 0 to −3 as authority varies from 0 to 100). Missionary: An active missionary increases unrest by +6. This applies even if the missionary is not making any progress due to occupation of the province or lack of conversion strength. Culture: provinces with cultures that are neither accepted nor part of the same group as the nation's primary culture get +2, or +1.5 in a republic. Occupation: +1 upon occupation, then +1 for every 6 months thereafter that the occupation continues. Rebel occupation does not increase unrest from this factor. Separatism: +15 for newly acquired provinces without a core, decays by −0.5 at the turn of each calendar year, effectively lasting 30 years. Modifiers to "Years of separatism" modify this by 0.5 per point. Provinces obtained by diplomatic annexation or colonization don't get separatism since they are automatically given cores, but bought and seized provinces do. Provinces conquered from primitives by non-primitives are also separatism-free, making them an even more attractive conquest target. Friendly troops: −0.25 per friendly regiment at 100% maintenance, up to a maximum of −5 with 20+ troops. The effect scales with maintenance level (down to zero at minimum maintenance). Local autonomy: manually changing local autonomy adds a province modifier lasting 30 years: "Increased Local Autonomy" decreases unrest by −10, while "Decreased Local Autonomy" increases unrest by +10. Recent Uprising: −100 unrest for 10 years. For all provinces associated with the recently active rebels. Knights Hospitaller idea 5: Ecumenical Defenders of Christendom. The Catholic decision Statute in Restraint of Appeals gives −1 national unrest. The Christian decision Advancement of Religion Act gives +1 national unrest. The Muslim decision Denouncement of Sect Practices gives −1 national unrest (until the ruler dies). The Muslim decision Establish an Ibadat Khana gives −1 national unrest. The Hindu decision Support the Advaita Movement gives −1 national unrest. The Pagan decision Encourage Divination gives −1 national unrest. Also worth considering are ideas that increase tolerance towards the religion of troublesome provinces or religious unity. Before conquering a province that you don't have a core on, consider ideas that reduce years of separatism. Also consider promoting its culture, which may require bonuses to maximum promoted cultures. Reduced stability cost and cost of reducing war exhaustion can make it easier to recover from bad situations. Finally, for an aggressively expansionist country, reduced core creation cost can help deal with overextension. Some events that have not been updated to use the current modifiers system give so-called base unrest. This decays at the rate of −1 per year. The main system for reducing unrest is local autonomy. Raising a province's local autonomy will give it −10 unrest for 30 years. Raising stability, lowering war exhaustion, hiring a Theologian advisor, moving (well-maintained) troops to the affected provinces, and changing culture (if it's not already accepted) also help. Longer term, changing religion will also help (assuming tolerance of the true faith is higher than tolerance of heretics and heathens, which it almost always is), but the presence of a missionary increases unrest in the short term. A newly acquired non-core province will gain 30 Years of separatism, except in the cases already mentioned above. Each year of separatism corresponds to a +0.5 "Separatism" local unrest modifier, which decays by this amount each year, so the base unrest from separatism is +15. If separatist rebels win a siege, they extend separatism by 10 years ( +5 "Separatism" local unrest modifier) and place a core of the primary nation of that province's culture if it does not exist there already. Total years of separatism is capped at 40 years. It is not possible to change the culture of a province that has a Separatism unrest modifier of any amount. The Steppe Nomads, Great Mongol State, and Tribal Federation government reforms have a −5 Years of separatism effect. It is possible to have 0 years of separatism immediately after conquering a province with Humanist idea 4 (−10), the Humanist-Offensive policy active (−5), a leader with the conqueror personality (−5), a government with separatism reduction (−5) and a national idea that reduces separatism (−5). Custom nations may also have 10 years of separatism reduction in their national ideas, which eliminates the need for a tribal or nomadic government. Forming a nation will remove all separatism in provinces owned at the time of formation as soon as they are cored (instantly if they already are cores, or if the formation grants cores - the only core-granting formation is currently that of Manchu). Diplomatically annexing a vassal or personal union, whether the usual way or by the decisions to form the Commonwealth or Spain diplomatically, will also remove all separatism in the former subject's provinces. Each province will be associated with exactly one rebel faction, however one rebel faction can spawn rebels in multiple provinces. All active rebel factions can be seen on the Stability and Expansion government tab, along with their current progress towards an armed uprising. This information can also be enabled in the outline. A rebel faction is associated with a set of demands, which can be seen by clicking the "Handle them!" button. Rebels will spawn in the highest development provinces with unrest of their faction first. The most common types of rebel factions are peasants, separatists, religious zealots, particularists, noble rebels, and pretender rebels. Peasant rebels want lowered taxes, i.e. higher provincial autonomy. Separatist rebels want to join an existing nation with their culture, or for a new nation to declare independence. Religious zealots want to convert the country to their preferred religion. They are most likely to come from provinces with an active missionary. Noble rebels are the strongest rebel type (financed by the nobility), they demand more autonomy and will raise autonomy on occupied provinces. Pretender rebels are particularly dangerous for countries that have personal unions. If pretenders in a junior partner win, they install a new ruler and break the union. Different tags will have their own separatist factions based on culture, and each different religion its own religious faction. A rebel faction will have the culture and religion of the provinces in which it appears. Some types of rebels want to become part of a different country. These have a "defection target" which is another country, which may or may not exist. Many types of rebels are made more likely by various country or province modifiers granted by events. ×0.5 Non-primary culture provinces while not in a Peasants' War. Will relocate over sea tiles. ×20.0 Court and country disaster. ×20.0 The Dacke Feud disaster. +30% Local autonomy in all provinces with particularist rebels. Burghers estate gains '15 influence for 15 years. If has Celestial Empire government has The Mandate of Heaven modifier. Has at least 0 Tolerance of the local religion. Has French Wars of Religion disaster. Has The Mandate of Heaven modifier. Does not have The Mandate of Heaven Lost modifier. ×1.2 Is not owner core. ×1.3 Has less than 75 Legitimacy or Horde Unity. ×1.3 Has less than 66 Legitimacy or Horde Unity. ×1.5 Has less than 0 Stability. ×1.5 Has less than -2 Stability. ×1.5 Does not have culture in the same group. ×2.0 Has Suppress Minority modifier. ×2.0 Has less than 1 Tolerance. ×2.0 Has less than −1 Tolerance. ×2.0 Has less than −2 Tolerance. ×3.0 Does not have the primary culture. Has The Mandate of Heaven Lost modifier. Add rebel county core to all provinces with this rebel faction and with rebels' culture. If target county exist, cede all core provinces. If target county does not exist, is released as an independent nation. The remaining rebel army switches allegiance to the rebel country. Government type changes to Constitutional Republic. Rebel leader becomes the new ruler. End Aspiration for Liberty disaster. The rebel army switches allegiance to the country rather than disbanding. If is a Revolutionary Republic, add 15 influence to Jacobins, remove Constitutional Project and Consolidation of Power modifiers. ×2.5 Has less than 66 Republican Tradition. ×2.5 Has less than 33 Republican Tradition. ×10.0 Is a Nobility province. +20% local autonomy in all provinces with noble rebels. −20 Legitimacy or Horde unity. Nobility estate gains 15 influence for 15 years. End The Count's Feud if it's in progress. ×0.5 Is after the 1700. ×3.0 Is after the 1450 and the Reformation hasn't happened. ×5.0 Has province Heresy modifier. +20% local autonomy and remove Heresy modifier in all provinces with heretic rebels. Is not Papacy or Colonial government. Has at least 3 cities. ×0.10 Is not core and is core for a same culture country. ×0.25 Has not the primary culture. ×0.50 At least 50 Legitimacy. ×0.75 At least 66 Legitimacy. ×2.0 Is a Republic with at least one Aristocratic idea. ×2.0 Regency with less than 85 Heir claim. ×3.0 Is the lesser partner in a Union with less than 75 Legitimacy. ×3.0 Is the lesser partner in a Union with less than 50 Legitimacy. ×3.0 Is the lesser partner in a Union with less than 25 Legitimacy. ×4.5 Is the lesser partner in a Union. ×5.0 Has less than 40 Republican tradition. ×5.0 Regency with less than 66 Heir claim. ×5.0 Regency with less than 33 Heir claim. ×20.0 If Denmark support the new monarch during the The Count's Feud. ×50.0 War of the Roses. If Inti country, revoke 2 religious reforms. Government type changes to rebels' preferred monarchy type. Rebel leader becomes the new ruler and kills the heir. End Time of Troubles, Civil War, English Civil War, Castilian Civil War disaster. Only for Japanese culture group. ×0.10 Is a Western or Eastern country. +10% local autonomy in all owned provinces. Government type changes to the rebels' preferred type..
×3.0 Is after 1400 and the reform is not already started. All owned provinces lose the "Lollards" modifier. ×0.1 Is an Elective Monarchy. ×3.0 Has Zebrzydowski rebellion modifier. +25% local autonomy in all provinces with noble rebels. −50 Legitimacy or Horde unity. Is not a Catholic nation. ×0.001 Has more than 5 Tolerance to Catholic. ×0.5 Has more than 2 Tolerance to Catholic. ×2.0 Has less than 1 Tolerance to Catholic. ×2.0 Has less than −1 Tolerance to Catholic. ×2.0 Has less than −2 Tolerance to Catholic. ×2000.0 Has an active missionary. Clergy estate gains 15 influence for 10 years. End French Wars of Religion disaster. Is NOT a Protestant nation. ×0.001 Has more than 5 Tolerance to Protestant. ×0.5 Has more than 2 Tolerance to Protestant. ×2.0 Has less than 1 Tolerance to Protestant. ×2.0 Has less than −1 Tolerance to Protestant. ×2.0 Has less than −2 Tolerance to Protestant. ×10.0 French Wars of Religion disaster. Is not a Reformed nation. ×0.001 Has more than 5 Tolerance to Reformed. ×0.5 Has more than 2 Tolerance to Reformed. ×2.0 Has less than 1 Tolerance to Reformed. ×2.0 Has less than −1 Tolerance to Reformed. ×2.0 Has less than −2 Tolerance to Reformed. Is not a Orthodox nation. ×0.001 Has more than 5 Tolerance to Orthodox. ×0.5 Has more than 2 Tolerance to Orthodox. ×2.0 Has less than 1 Tolerance to Orthodox. ×2.0 Has less than −1 Tolerance to Orthodox. ×2.0 Has less than −2 Tolerance to Orthodox. Is not a Coptic nation. ×0.001 Has more than 5 Tolerance to Coptic. ×0.5 Has more than 2 Tolerance to Coptic. ×2.0 Has less than 1 Tolerance to Coptic. ×2.0 Has less than -1 Tolerance to Coptic. ×2.0 Has less than -2 Tolerance to Coptic. Is not a Anglican nation. ×0.001 Has more than 5 Tolerance to Anglican. ×0.5 Has more than 2 Tolerance to Anglican. ×2.0 Has less than 1 Tolerance to Anglican. ×2.0 Has less than -1 Tolerance to Anglican. ×2.0 Has less than -2 Tolerance to Anglican. Is NOT a Sunni nation. ×0.001 Has more than 5 Tolerance to Sunni. ×0.5 Has more than 2 Tolerance to Sunni. ×2.0 Has less than 1 Tolerance to Sunni. ×2.0 Has less than −1 Tolerance to Sunni. ×2.0 Has less than −2 Tolerance to Sunni. Clergy estate gains '15 influence for 10 years. Is not a Shiite nation. ×0.001 Has more than 5 Tolerance to Shiite. ×0.5 Has more than 2 Tolerance to Shiite. ×2.0 Has less than 1 Tolerance to Shiite. ×2.0 Has less than −1 Tolerance to Shiite. ×2.0 Has less than −2 Tolerance to Shiite. Is NOT a Ibadi nation. ×0.001 Has more than 5 Tolerance to Ibadi. ×0.5 Has more than 2 Tolerance to Ibadi. ×2.0 Has less than 1 Tolerance to Ibadi. ×2.0 Has less than −1 Tolerance to Ibadi. ×2.0 Has less than −2 Tolerance to Ibadi. Is not a Theravada nation. ×0.001 Has more than 5 Tolerance to Theravada. ×0.5 Has more than 2 Tolerance to Theravada. ×2.0 Has less than 1 Tolerance to Theravada. ×2.0 Has less than −1 Tolerance to Theravada. ×2.0 Has less than −2 Tolerance to Theravada. Is not a Vajrayana nation. ×0.001 Has more than 5 Tolerance to Vajrayana. ×0.5 Has more than 2 Tolerance to Vajrayana. ×2.0 Has less than 1 Tolerance to Vajrayana. ×2.0 Has less than −1 Tolerance to Vajrayana. ×2.0 Has less than −2 Tolerance to Vajrayana. Is not a Mahayana nation. ×0.001 Has more than 5 Tolerance to Mahayana. ×0.5 Has more than 2 Tolerance to Mahayana. ×2.0 Has less than 1 Tolerance to Mahayana. ×2.0 Has less than -1 Tolerance to Mahayana. ×2.0 Has less than -2 Tolerance to Mahayana. Is NOT a Confucian nation. ×0.001 Has more than 5 Tolerance to Confucian. ×0.5 Has more than 2 Tolerance to Confucian. ×2.0 Has less than 1 Tolerance to Confucian. ×2.0 Has less than −1 Tolerance to Confucian. ×2.0 Has less than −2 Tolerance to Confucian. Is not a Shinto nation. ×0.001 Has more than 5 Tolerance to Shinto. ×0.5 Has more than 2 Tolerance to Shinto. ×2.0 Has less than 1 Tolerance to Shinto. ×2.0 Has less than −1 Tolerance to Shinto. ×2.0 Has less than −2 Tolerance to Shinto. Is not a Hindu nation. ×0.001 Has more than 5 Tolerance to Hindu. ×0.5 Has more than 2 Tolerance to Hindu. ×2.0 Has less than 1 Tolerance to Hindu. ×2.0 Has less than −1 Tolerance to Hindu. ×2.0 Has less than −2 Tolerance to Hindu. Clergy estate gains 15' influence for 10 years. Is not a Sikh nation. ×0.001 Has more than 5 Tolerance to Sikh. ×0.5 Has more than 2 Tolerance to Sikh. ×2.0 Has less than 1 Tolerance to Sikh. ×2.0 Has less than −1 Tolerance to Sikh. ×2.0 Has less than −2 Tolerance to Sikh. ×0.001 Has more than 5 Tolerance to Animist. ×0.5 Has more than 2 Tolerance to Animist. ×2.0 Has less than 1 Tolerance to Animist. ×2.0 Has less than −1 Tolerance to Animist. ×2.0 Has less than −2 Tolerance to Animist. ×0.001 Has more than 5 Tolerance to Fetishist. ×0.5 Has more than 2 Tolerance to Fetishist. ×2.0 Has less than 1 Tolerance to Fetishist. ×2.0 Has less than −1 Tolerance to Fetishist. ×2.0 Has less than −2 Tolerance to Fetishist. Is not a Totemist nation. ×0.001 Has more than 5 Tolerance to Totemist. ×0.5 Has more than 2 Tolerance to Totemist. ×2.0 Has less than 1 Tolerance to Totemist. ×2.0 Has less than −1 Tolerance to Totemist. ×2.0 Has less than −2 Tolerance to Totemist. Is ' not a Nahuatl nation. ×0.001 Has more than 5 Tolerance to Nahuatl. ×0.5 Has more than 2 Tolerance to Nahuatl. ×2.0 Has less than 1 Tolerance to Nahuatl. ×2.0 Has less than −1 Tolerance to Nahuatl. ×2.0 Has less than −2 Tolerance to Nahuatl. Is not a Mayan nation. ×0.001 Has more than 5 Tolerance to Mayan. ×0.5 Has more than 2 Tolerance to Mayan. ×2.0 Has less than 1 Tolerance to Mayan. ×2.0 Has less than −1 Tolerance to Mayan. ×2.0 Has less than −2 Tolerance to Mayan. Is not an Inti nation. ×0.001 Has more than 5 Tolerance to Inti. ×0.5 Has more than 2 Tolerance to Inti. ×2.0 Has less than 1 Tolerance to Inti. ×2.0 Has less than −1 Tolerance to Inti. ×2.0 Has less than −2 Tolerance to Inti. Is not a Tengri nation. ×0.001 Has more than 5 Tolerance to Tengri. ×0.5 Has more than 2 Tolerance to Tengri. ×2.0 Has less than 1 Tolerance to Tengri. ×2.0 Has less than −1 Tolerance to Tengri. ×2.0 Has less than −2 Tolerance to Tengri. Is NOT a Norse nation. ×0.001 Has more than 5 Tolerance to Norse. ×0.5 Has more than 2 Tolerance to Norse. ×2.0 Has less than 1 Tolerance to Norse. ×2.0 Has less than −1 Tolerance to Norse. ×2.0 Has less than −2 Tolerance to Norse. Is not a Jewish nation. ×0.001 Has more than 5 Tolerance to Jewish. ×0.5 Has more than 2 Tolerance to Jewish. ×2.0 Has less than 1 Tolerance to Jewish. ×2.0 Has less than −1 Tolerance to Jewish. ×2.0 Has less than −2 Tolerance to Jewish. Is not a Zoroastrian nation. ×0.001 Has more than 5 Tolerance to Zoroastrian. ×0.5 Has more than 2 Tolerance to Zoroastrian. ×2.0 Has less than 1 Tolerance to Zoroastrian. ×2.0 Has less than −1 Tolerance to Zoroastrian. ×2.0 Has less than −2 Tolerance to Zoroastrian. Has Cossacks estate is enabled. ×15.0 Is controlled by Cossacks estate. Create an independent Cossacks nation. ×0.8 Has at least 33 Horde Unity. ×0.8 Has at least 50 Horde Unity. ×0.8 Has at least 66 Horde Unity. ×0.8 Has at least 75 Horde Unity. ×1.25 Has at least 12 provinces. ×1.25 Has at least 18 provinces. ×1.5 Has at least 24 provinces. ×1.5 Has at least 30 provinces. ×1.5 Has at least 40 provinces. ×2.0 Has at least 50 provinces. ×10.0 During a Tribal succession crisis. ×15.0 Is controlled by Tribes estate. +30% Local autonomy in all provinces with tribal rebels. Tribes estate gains 15 influence for 10 years. Each month a rebel faction has a chance to make progress towards a full-scale rebellion. The monthly chance that a rebel faction's progress will increase by 10% depends on the sum of positive unrest in all provinces associated with that faction and the country's level of Overextension; maxing out at 75% progress chance. Rebel monthly progress chance, positive unrest in all provinces associated with that faction and expected time until rebellion can be found in the tooltips for that faction's progress in the Stability and Expansion tab, and the Outliner. If the faction's progress reaches 100%, it will go into open rebellion and spawn troops in some of the provinces that had positive unrest. Maximum of 75%, display is rounded down to the first decimal. Yes, the chance of progress for unrest between 50 and 100 is LESS THAN the chance at 50 and 100 unrest, with a low point of 18.75% at 75 unrest. If a country has at least 101% Overextension, then this base chance is multiplied by (1 + Overextension/50), still capped at 75%. If none of the provinces supporting a rebel faction has positive unrest, its accumulated progress will begin to decay by 10% per month thereafter. If unrest is then increased for any reason, the faction will resume gaining progress towards rebellion. It is possible to reduce a rebel faction's progress to 0 at any time by accepting their demands. This will also remove any troops that faction has spawned. The demands are generally quite unpleasant, however, so this is usually an undesirable option unless the rebels have already rebelled or are on the verge of doing so. It is also possible to check the country's subject's rebellion progress by ticking the box next to the current national unrest on the rebellion's page. Rebel progress can be reduced at a fixed rate of -30% through harsh treatment, at the cost of military power. This action will cost between 50 to 200 points, scaling with the sum of all positive unrest in provinces supporting a particular faction. The faction's progress must be at least 30% for harsh treatment to be available. This can be made more cost effective if the total unrest can be reduced to a small number with the presence of friendly troops, allowing a large amount of rebel progress to be removed at once at a lower price. It is generally best to use harsh treatment as a temporary measure for buying time to deal with the underlying unrest causing a rebel faction rather than as a means of preventing all rebellions, as the military point cost can add up quickly. If the source of unrest is ticking down over time (such as the unrest caused by separatism), or will be removed at a known point in the future (such as a missionary finishing converting a province), harsh treatment can prevent a future revolt by delaying the progress long enough for the underlying unrest to disappear. If the unrest will not or cannot be removed in a reasonable amount of time, it may be preferable to let the rebellion happen and crush it militarily if there are no other pressing threats to the nation。 However, if combined with stationing troops on the rebellious provinces (and maluses such as separatism ticking away), sometimes it is possible to completely prevent a rebellion with the strategic use of harsh treatment. Rebels can also spawn via events. In this case they immediately get troops on the map, regardless of any faction progress. They can then be engaged in military combat or have their demands accepted as with any other rebels. One special case that can be encountered are pretender rebels. These can spawn not only via event, but also when an heir without a strong claim succeeds to the throne in a monarchy, whereas they rarely exist as a faction gathering progress from unrest. If these rebels control the capital city for 36 months, they will install a new ruler, whose stats can be seen in the "Stability and Expansion" tab. Upon annexation the remaining armies of annexed country will become separatist rebels. Rebel stacks have spawn size 1 unless they are spawned by an event that sets a larger size. The number of rebel artillery spawned is increased by 10% of the base at technology 11 and another 15% of the base at technology 16. Unfortunately for small countries, it is quite possible that a single spawn contains more regiments than their land force limit if they have annexed a significant number of provinces. This is unaffected by national morale modifiers. Strangely, your national discipline modifiers are applied to rebels - so be careful when fighting your own rebels with attached troops from your subjects. Rebel stacks will siege the provinces they spawn in, idle several months, then move on to another province and repeat the process. Non-separatist rebels may eventually siege arbitrary provinces that are not actually associated with their faction, especially when all their faction's provinces are already occupied. The province will then change its rebel type to the sieging faction. This is usually beneficial because it prevents separatist uprisings, but if all provinces of a rebel faction are occupied by different rebel factions, the rebels' progress percentage is instantly added to that of one of the occupying factions, which causes an immediate uprising (even in the middle of the month) if the sum is 100% or more. Peasant, particularist, Lollard, noble, or pretender rebels: Province gains +10 autonomy. Separatist rebels: +10 years of separatism (effective +5 unrest), unless the rebels had already occupied that province. They will also give their nation a core on the province, if it doesn't have one already. Religious rebels of a heretic or heathen religion, and the province did not follow the rebels' religion: Instant conversion to the rebels' religion, as well as −40% manpower, −33% tax income and +2 unrest for 2 years ("Forced Conversion" modifier). Active missionaries are also ejected and their progress lost; usually, missionary progress is merely frozen until a province is unsieged. This makes religious rebels quite dangerous, but also potentially a powerful conversion tool. Religious rebels of the state religion: −15% manpower and −15% tax income for 2 years ("Religious Violence" modifier). Notably, they do not convert provinces that do not follow the state religion. Heretic (not religious!) 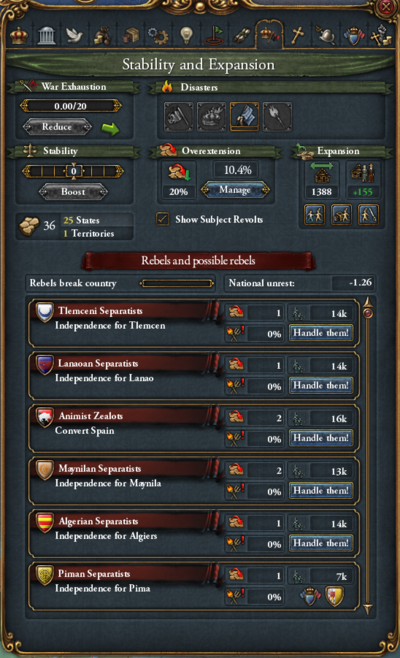 rebels: -40% manpower, −33% tax income, +2 unrest and +5 local autonomy for 2 years. Catholicism will gain +0.1% reform desire. If an army starts to unsiege a province occupied by rebels, rebel stacks of the occupying faction may move to attack it. Otherwise, all stacks will stay static after all applicable provinces have been sieged. If separatist rebels occupy a province, they will start a 5-year timer. If the province is not retaken in that time, that province will defect, or if the target country no longer exists, all the provinces associated with the separatist faction will declare independence, even if some of them are occupied by another rebel faction. Other types of rebels need to occupy the capital to enforce their demands, but for this the timer is only 2 years (3 years for pretender rebels). There is an automatic warning when rebels are close to enforcing demands, but it does not trigger if foreign separatists have sieged a province in your country, so be careful. As a special case, if a country is not at war and more than half its provinces (including at least one fort) are occupied by rebels - not necessarily from the same faction - all active rebel factions have their demands enforced immediately ("breaking the country"). This will likely have drastic negative effects, but it also resets war exhaustion and stability to 0, so it can actually be used constructively if playing particularly aggressively. Since retaking a province from rebels resets its occupation timer, it is not actually necessary to immediately defeat rebels if it is currently inconvenient to do so, or if you are hoping for allies or enemies to take care of them for you. It is, however, recommended to take care of separatists quickly, both to prevent province defections and to prevent adding more long-lasting unrest. A diplomat can support rebel factions in other nations, increasing the chance they rebel. This is a covert action that can be performed by any country with administrative technology at least 3 (in 1444 this includes countries in all technology groups except for West African, Central African, and primitives). The effectiveness of supporting rebels can be increased by a number of ideas and policies. If there is more than one rebel group in the targeted country, then the funding country must choose which group to support. A country can only support one rebel faction in each target country. Supporting rebels requires a spy network size of at least 60. It also requires a one-time monetary cost proportional to the size of the rebellious faction. Upon confirming the action, the supported rebel faction will get a base +10% per month increase to their chance of making progress towards an uprising for the next 5 years. Rebel support efficiency ideas modify this base chance; for example a country with +50% rebel support efficiency would increase the supported faction's chance of making progress by +15% per month. This does not actually change unrest in the affected country but rather directly affects the monthly progress chance, making it difficult to counter except by using harsh treament. Supported rebels will behave like allied units of their sponsoring country, even if the sponsorship only began after the rebels have spawned - but they are unfortunately still hostile to the sponsor's allies and subjects. Any rebels that manage to declare independence while under foreign support will receive a relation bonus towards the supporting country. If allied rebels cannot complete their objectives because the province they are trying to occupy is under their ally's control, they will wander the countryside instead and may engage enemy units. In addition, supporting rebels in a rival country will also increase the power projection of the conducting state for the duration of the covert action. The magnitude of power projection granted is proportional to the amount of income spent on supporting rebels. With the Art of War DLC, once the rebels have spawned, the supporter receives the "Support Rebels" casus belli to enforce the supported rebels' demands. The war will be called an Intervention War, and the war goal is to take the capital. The war can continue even if all the spawned rebels are defeated, and provinces can be taken from them, 50% warscore is needed to enforce rebels demands, and the player may get call for peace if the opponent is already willing to agree with it. Rebels that break free get an alliance and +200 opinion modifier with the (if any) country that supported them. Go to war in support of a rebel faction and win, enforcing their demands. Have rebels you support in another country enforce their demands. The most effective way to deal with rebels is to combat the root of the problem: keep unrest low by keeping stability high, do not let war exhaustion get out of hand, station troops (up to 20 regiments) in the province, and use appropriate decisions, advisors, etc. Lowering local autonomy immediately increases the amount of money and manpower a province provides, but this will add +10 unrest to the province for the next 30 years. Typically, this will give two rebellions over the 30-year time period taking into account the 10-year periods of −100 unrest from the Recent Uprising modifier after a rebellion happens. Sometimes it may not be possible to lower autonomy in a province if it is already at its minimum autonomy floor. Raising local autonomy immediately reduces the amount of money and manpower a province provides, but the −10 unrest it gives for 30 years will usually keep unrest low enough to prevent rebellions, barring additional sources of unrest (such as active missionary, dutch nationalism, etc). Local autonomy normally ticks down over time (especially while at peace), so the value lost by raising local autonomy will be regained slowly over time. Separatism from a newly conquered province ticks down over a similar 30-year period, so its effects will be gone by the time the effects of raising autonomy wear off. It is not always possible to go entirely without unrest, but there is often a choice as to where the unrest is. A classic divide and conquer strategy can be very beneficial: spreading the unrest between several different rebel factions will keep all of them weaker and make each individual one easier to deal with. When lowering autonomy, choose provinces with weak factions and be careful not to lower the autonomy in all provinces of a faction at the same time in order to keep the unrest at a non-threatening level. One united rebel faction with 25 unrest is a serious problem; five different factions with 5 unrest each are manageable. If a large rebel faction makes progress such that they are close to a revolt, using harsh treatment on them can be useful, unless it is certain they can be handled militarily. Remember that the cost of harsh treatment is based on the unrest in the associated provinces, so let the faction progress tick up to 75% or more, then apply all possible short term measures to reduce unrest such as moving troops to those provinces or reducing war exhaustion, before finally applying harsh treatment up to 3 times while it's cheap. If rebels do revolt and cannot be contained militarily, it is always possible to accept their demands; this will likely be painful in the short term, but can be a better choice than allowing them to continue to wreak havoc, and allow rebuilding to begin sooner. Finally, keep in mind that in some cases it may actually be desirable to accept the rebel demands. This happens most often with religious rebels or pretender rebels. Religious rebels might enable switching to a more powerful religion and will even convert provinces automatically, and it is beneficial to check the stats of a potential pretender before engaging his troops, as there may be a 6/6/6 monarch just waiting for his demands to be accepted. ↑ See in /Europa Universalis IV/common/static_modifiers/00_static_modifiers.txt (Static modifiers#Unrest). ↑ See in /Europa Universalis IV/common/static_modifiers/00_static_modifiers.txt (Static modifiers#Local autonomy). ↑ See in /Europa Universalis IV/common/defines.lua. ↑ See in the patch notes of 1.14. This page was last edited on 21 March 2019, at 15:56.